To help diagnose bone marrow disorders known as myeloproliferative neoplasms (MPNs) in which the bone marrow produces too many of one or more types of blood cells. JAK2 is an intracellular tyrosine kinase and a member of the JAK (Janus Kinase) family. It is involved in the signal transduction pathway of hematopoietic and immune system. The V617F point mutation is one of the most common molecular abnormalities found in exon 14. It is most frequently found in myeloproliferative disorders (MPDs) such as, polycythemia vera (PV), Essential thrombocythemia (ET) or primary myelofibrosis (PMF), and in BCR-ABL negative MPDs. 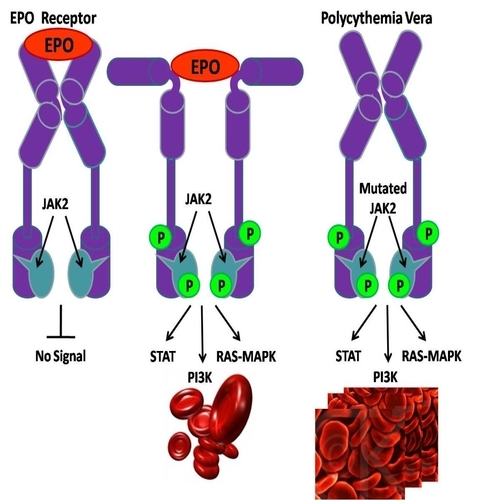 While a minority of patients with JAK2 V617F-negative myeloproliferative disorders a mutation in exon 12 of JAK2 is found.